Porsche has confirmed it will unveil an all-new compact sports car at the 2012 Los Angeles Auto Show. In a press release, Porsche has announced the reveal of an all-new compact sports car that will make its world premiere here in the U.S. The new Porsche compact sports car will be unveiled at the 2012 Los Angeles Auto Show at a press conference on November 28th. The international press will get a first glimpse of the new Porsche sports car at the Porsche show booth. Reports say the new Porsche sports car will be the long-awaited 2014 Porsche Cayman that has been seen as a prototype and captured in camouflage for the past two years. It’s no secret why Porsche has chosen the U.S., and particularly LA, to reveal the new 2014 Porsche Cayman to the world. The U.S. market and California continues to be the world’s largest Porsche market. The German automaker wants to continue on with that sustained success here in the U.S. and will also use the LA Auto Show for the U.S. premiere of the new 2014 Porsche 911 Carrera 4. Strong Porsche sales in the U.S.
With the U.S. being the world’s number one Porsche market, the German automaker has seen a large sales gain this year and has delivered 28,226 vehicles in the first ten month’s of 2012. Of those vehicles, 9,764 were sports cars which represents a 13 percent gain. Porsche says that in October alone, 3,211 new Porsche cars were delivered to customers for a substantial 41 per cent gain compared to the same month last year. With the world premiere of the new 2014 Porsche Cayman in LA, Porsche is looking to continue that sales trend. 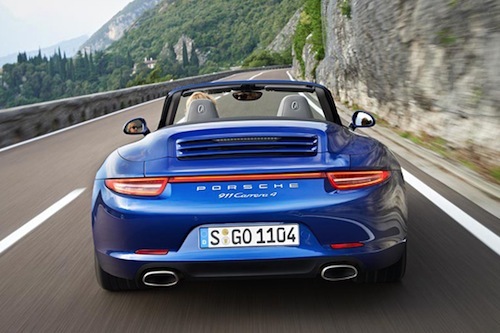 The all-new 2014 Porsche 911 Carrera 4 and Carrera 4S models will also be making their U.S. debut in LA. The new seventh-generation 911 Carrera 4 models will have Porsche’s latest version of the active all-wheel-drive system, Porsche Traction Management (PTM). They will also be lighter, more fuel-efficient and offer new technology. The 2014 911 Carrera 4 and 911 Carrera 4S, both Coupe and Cabriolet will all be fitted with the new all-wheel-drive system. The AWD Carrera 4 models will be launched with the same lightweight body design, suspension, engines and gearboxes as the rear-wheel drive versions. Porsche says the new 2013 models will use significantly less fuel even with a higher level of performance than the previous models. As most automakers are doing today, Porsche has reduced weight in the new 911 Carrera 4 by up to 143 pounds with an increase in fuel mileage as much as 16 percent. The new 2014 models will also receive new exterior enhancements. With the premiere of the 2014 Porsche Cayman and the 2014 911 Carrera 4, Porsche is creating ideal conditions and is counting on continued success here in the U.S. and California.